Winter may define Canadians but that doesn’t mean there isn’t a collective sigh of relief when Mother Nature shows Old Man Winter the door each spring. Spirits soar with those first signs of the changing seasons – flowers and trees blooming, birds singing, days growing longer, and temperatures slowly warming. There’s no better way to celebrate this rebirth than with a festival and Canadian communities do just that from coast-to-coast during April, May and June. Three of the best known spring celebrations are the Vancouver Cherry Blossom Festival, the Canadian Tulip Festival in Ottawa, and the Annapolis Apple Blossom Festival in Nova Scotia. 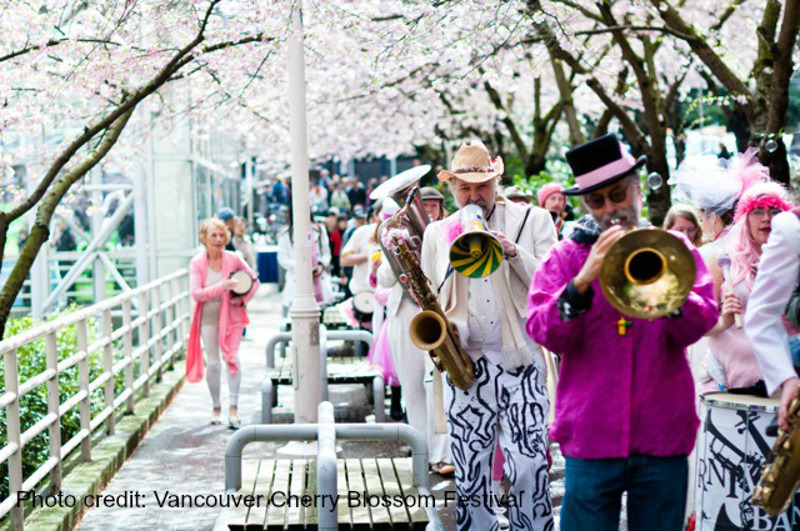 This year the festival runs from April 3rd-28th with a full schedule of mostly-free community events beginning with the popular Cherry Jam Downtown Concert. The celebration continues over the course of the month with garden tours, art demonstrations, guided walks, and many special events including the Cherry Blossom picnic and a free, guided Bike the Blossoms. Some of the best blossom viewing in the city is in Van Dusen Botanical Garden, which also hosts the Sakura Days Japan Fair celebrating the culture, traditions and food of Japan. This year some of Vancouver’s top Japanese chefs are also lending support for the first-ever Sakura Night. This charitable event is a celebration of Japanese cuisine, which will raise funds for the festival. In Ottawa-Gatineau, it’s the tulips in bloom that signal the arrival of spring. 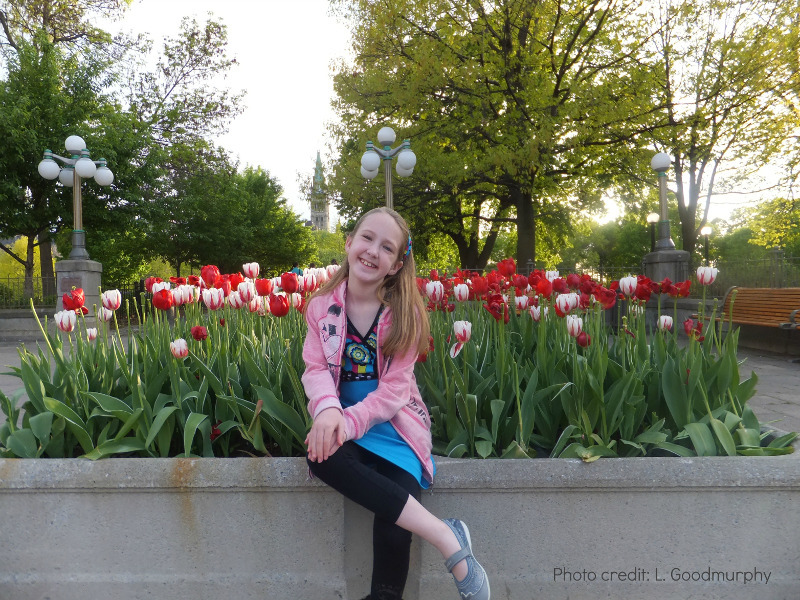 The Capital Region’s tulips have an interesting history, dating back to World War II when Canada provided safe haven to Princess Juliana of the Netherlands and her daughters. After the war’s end, the Dutch gifted Canada with tulip bulbs as a thank you and as a symbol of friendship between the two countries. The tulips were so popular that, in 1953, the Ottawa Board of Trade proposed holding an annual tulip festival to coincide with the blooming of the flowers and the Canadian Tulip Festival was launched. 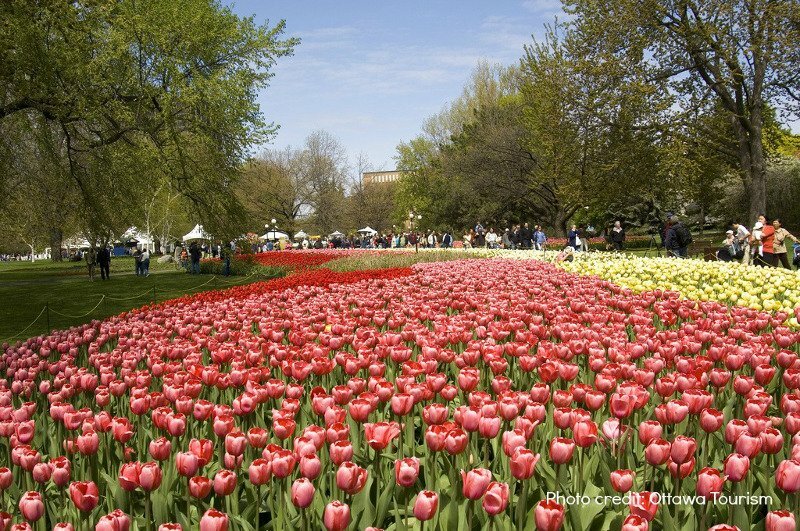 It is now the largest tulip festival in the world and will run May 9th-19th this year. More than 1 million bulbs are showcased across the Capital Region each year, with popular viewing locations in Commissioners Park, Major’s Hill Park and around Parliament Hill. There’s much more to do than just look at flowers as the festival boasts a full slate of fun activities and entertainment for everyone including bicycle tours, free concerts at City Hall, treasure hunts, family activities, a competitive display of tulips at Floral Plaza, and a spectacular Victoria Day firework display to close out the celebration. 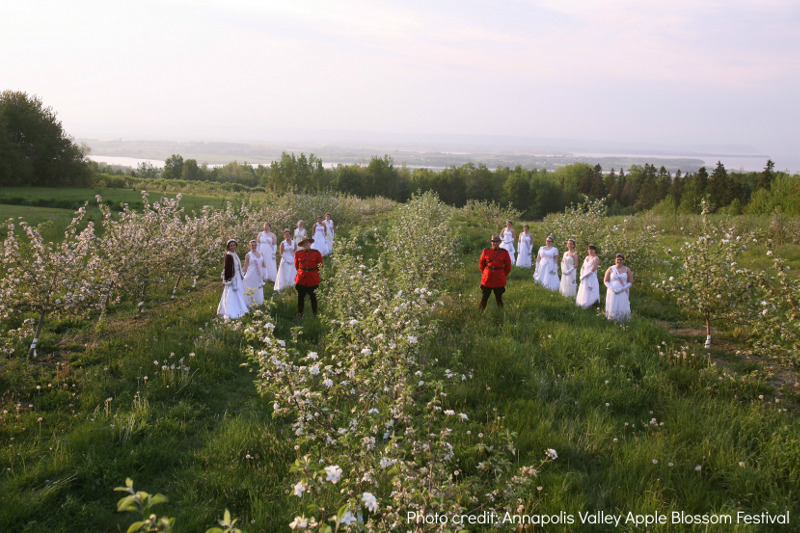 The Annapolis Valley, located along Nova Scotia’s Bay of Fundy, will celebrate the 82nd annual Apple Blossom Festival in 2014 from May 28th– June 2nd. The first apple blossom festival was held in 1933 to promote the apple industry, showcase the scenic beauty of the area and celebrate the end of winter and the promise of a new growing season. The festival, which now marks the start of Nova Scotia’s tourism season, is a top tourist attraction in the region and has even had the honour of being recognized on a Canadian postage stamp. Visitors and residents enjoy driving through the valley to view the blossoming trees in the apple orchards as well as participating in the long list of family-friendly activities and events that are part of the Apple Blossom Festival. These include hikes and tours, concerts, barbeques, community teas, craft fairs, fireworks, the coronation of a Festival Queen and two highly anticipated parades. The Apple Blossom Grand Street Parade, one of the largest parades in Canada, has been a highlight since the festival’s inception, and a children’s parade held earlier the same day provides youngsters with the opportunity to show up in costume and parade through downtown Kentville. The festival is fun for residents and visitors alike as everyone joins in the springtime celebration. These festivals and others like them are a fun way for Canadians of all ages to celebrate the arrival of spring. Anyone planning to travel out-of-province, however, should remember to buy travel insurance as your provincial health plan will not fully cover out-of-province medical emergencies. I’ve been lucky enough to visit all three parts of Canada during the festivals. It would be hard to pick a favourite but I must say I do miss the early blossoms that Vancouver is so lucky to see. I’m writing this during a Calgary blizzard so the thought of seeing some colour again in my life has tremendous appeal. Thanks for the comment! 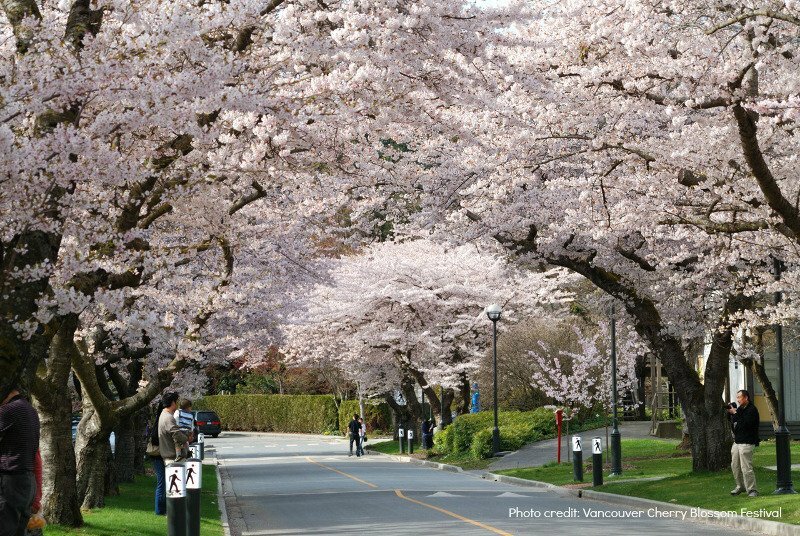 Hope you can come visit Vancouver during the cherry blossom bloom. Stay warm in Calgary- that blizzard looks impressive! Spring is such a glorious time to visit Canada. Cherry blossoms and tulips are enough to make me want to visit Canada soon. We missed the tulips by a few weeks during our visit to Ottawa a few years ago. I love that they organize parades and other activities to celebrate the season. We hope you come visit Canada soon! It’s pretty spectacular here in Vancouver right now- all fluffy blooms in various shades of pink. Hopefully you’ll come visit sometime! This brings back memories of Ottawa’s Tulip Festival — the best part of spring, in my opinion. After the drabness of winter, it was always a breath of fresh air to have color all over the city. Would love to experience the Cherry Blossom and Apple Valley Festivals. They look quite impressive. Flowers always make me feel happy. Spectacular photos! I’ve been to Ottawa’s tulip festival and heard of Vancouver’s cherry blossom festival but this is the first I’ve heard of Annapolis’s apple blossom festival! Definitely looks worth a road trip. Canadian Tulip Festival was first held in the year 1953 in Ottawa.